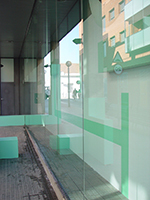 This temporary site specific installation was made for an added wing of the Museum Abello in Spain. 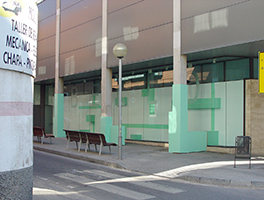 Behind a glass facade runs a continuous wall, creating the effect of a shop window for which artists are invited to provide work which can only be viewed from outside of the museum. For her piece, Korfmann decided to work with the formal construction of the building itself and the details she found there. 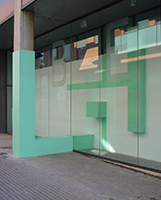 Architectonic elements such as the exterior support pillars of the building were outfitted with green panelling the form of which directly connected through the glass to the formal elements she had assembled along the inside wall. 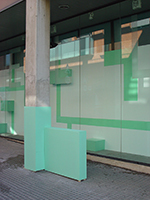 In this way the work might be perceived to break traditional barriers and spread outside the building. Thus the transition from the outside to the inside of the museum space was illustrated in a very concrete manner. The title makes clear that the work is offered more in the way of a provisional proposal for a spatial intervention which leaves many perspectives open.